Update: April 15, 2019 – It will launch on Flipkart, similar to Realme 3. It once again teases the phone’s battery with fast charging and gaming. 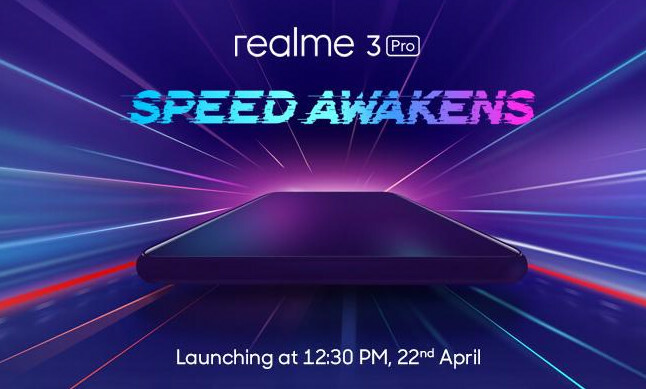 Earlier: Realme at the Realme 3 launch event promised that the Realme 3 Pro will launch in April. Today the company has confirmed that it will be launching in the country on April 22nd at an event in Delhi University. The teaser says ‘Speed Awakens’ for the performance of the phone. Realme CEO Madhav Sheth recently said that it will be the first phone in the segment to support and said that it will be a powerful chipset. It also teased the phone in an image along with the box of the Redmi Note 7 Pro, so this will likely come with a 48-megapixel rear camera. It is also rumored to feature a 25-megapixel front camera. He also teased the camera quality of the phone with some sample images. We should know more details in the coming days.